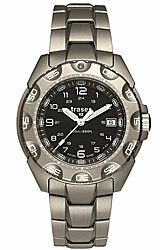 Now experience the bold UZI design in a powerful new watch, The Titanium Defender. Super lightweight, yet 40% stronger than stainless steel. This UZI is up to any task, any situation. From deep underwater to at the peak of the highest mountains, from the scorching deserts of Iraq to the artic cold, the Titanium Defender is the toughest watch UZI has ever made. Water resistant to 200 meters, or 660 feet, below sea level, the UZI Defender has a screw down crown and a screw down case back. The crystal is hardened, scratch resistant, mineral glass. The solid titanium bracelet has a double locking clasp. And the UZI Defender has a unique style all it's own. This is no copycat watch! It's an UZI original. 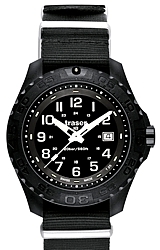 We are an Authorized UZI Tritium WATCH Dealer. Every UZI Watch you purchase from us is brand new, first quality, in the box, with all manufacturer's instructions and warranty booklets. "Protected By Uzi" takes on a whole new meaning with the Tritium H3 Watch Collection. 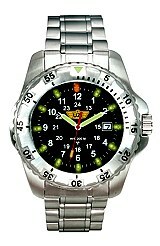 All UZI Tritium Watches have a full One Year Limited Warranty.